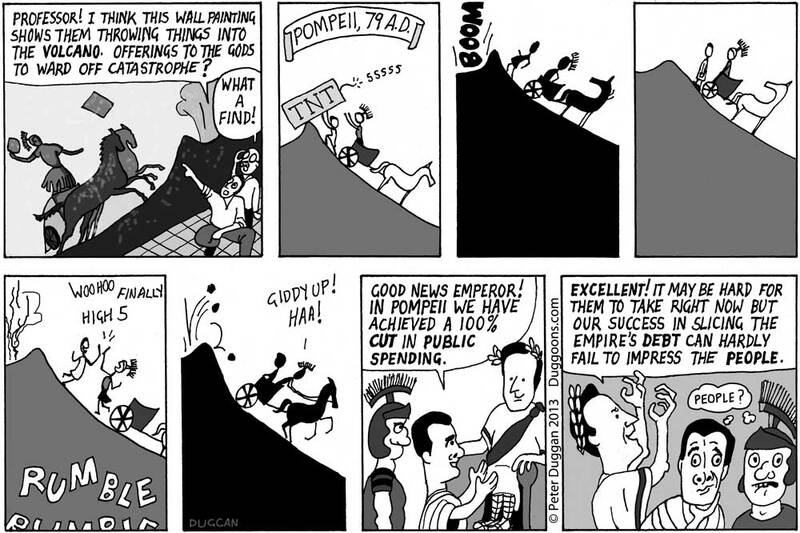 The very creative fiscal manager in this cartoon is George Osborne, current Chancellor of the UK. The emperor is, of course, David Cameron. Sniffing around for an angle, I looked up the name of the Roman emperor in charge the year Vesuvius erupted. It just so happened that in 79 AD there was a change of emperors, from Vespasian to Titus. Who was in charge the day the lava started flowing? I looked it up (Oh please be Titus! Please be Tightarse!) It was Tightarse! Unfortunately I ran out of room and had to forego that route. Ahh….say lovee. An aside – I never know whether to use BC/AD or BCE/CE for dating. For an update on who’s winning the BC/AD – BCE/CE war, see here. I believe it should be the latter as it’s slightly weird looking at ancient Buddhist statues labelled 300 BC, but if I’m worried about confusing the reader I’ll go with BC/AD. After a careful assessment I have used caution with you, dear reader.